As Marine Corps Times forecasted in a story Saturday morning, Maj. Gen. John Toolan has taken over as commander of II Marine Expeditionary Force (Forward) and Regional Command-Southwest. The transfer of authority from Maj. Gen. Richard Mills and I MEF (Fwd.) 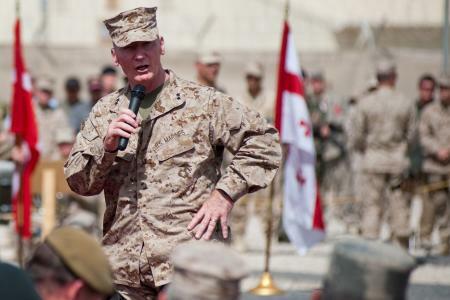 puts Toolan in charge of more than 20,000 Marines, primarily in volatile Helmand province. I had the opportunity to interview Mills last week by telephone before he stepped down as commander. He was candid in offering perspective on where things have improved, but also warned that Marines will face another push from the insurgency this spring. 1. He’s a combat veteran: Toolan is no stranger to commanding troops in combat. In fact, he commanded Regimental Combat Team 1 as a colonel in Fallujah, Iraq, in 2004. As outlined in this PBS profile, he had just assumed command when four private security contractors with Blackwater were ambushed and murdered in the city on March 31, 2004. Their bodies were hung from bridges. I arrived around March 22 or so, and this was 10 days before we were going to take control of the area — transfer of authority, they call it. And when I arrived we went into Fallujah, and on our way into Fallujah we were ambushed. Rockets, RPGs [rocket-propelled grenades], small arms. They threw the whole thing at us. So we fought our way through, which is basically just to push our way through. We really didn’t stop and address the ambush, which we started doing more of later on. But then we went in, but we were going into a meeting, a city council meeting. So when we got in there, we were there for about 20 minutes, and the security team outside was attacked — rockets, mortars. I had about five casualties at that point that I had to medevac out. 2. He was picked for the job: It’s no accident that Toolan has this command. He was selected to be the commander of 2nd Marine Division, out of Camp Lejeune, N.C., and took over last July, one month before II MEF (Fwd.) headquarters was established. 3. He knows Gen. Mattis well: As commander of RC-Southwest, Toolan will be working closely with Gen. David Petraeus, the top commander in Afghanistan, and Gen. Jim Mattis, the head of U.S. Central Command. At the very least, he certainly has worked with Mattis before. In April 2003, during the early stages of the Iraq war, Mattis — then commander of 1st Marine Division, out of Camp Pendleton, Calif. — relieved Col. Joe Dowdy as commander of 1st Marine Regiment and installed Toolan. As pointed out in this LA Times story, Toolan was viewed at the time as “a hard-charging commander who had been intimately involved in the division’s battle plan” and who was close to Mattis. We need Marines who will put their teeth into the bad guys and not let go. No problem; our Marines will do that. But we also have to work with people. We’re going there to secure and serve the population; the people of Afghanistan are the center of gravity. Toolan also spoke up when the Corps stopped requiring that the dress blue uniform be worn to notify families of casualties. The service ultimately decided to make the dress service alpha uniform standard for casualty notification, with dress blues allowed with approval from higher command. Toolan said casualty notification is a solemn event that deserves full honors. 5. He’s a family man: Toolan’s official biography notes that he has three children. They include Capt. Sean Toolan, who was born while the general was a company commander with 2nd Battalion, 7th Marines, out of Camp Pendleton <strike>Twentynine Palms</strike>, Calif.
UPDATE: Toolan spoke briefly during the change of command ceremony Saturday in Afghanistan. Video is posted here. UPDATE 2: An oversight on my part: 2/7 was based at Camp Pendleton when Toolan served with the unit. It was relocated to Twentynine Palms in 1990. Damn right!!! Bring back the dress blues. That’s the least the Corps can do to honor the families of those who have given their lives in honor of our country and Corps and to honor our fallen Marines. I am a former USMC Captain and my Marine Cpl son was KIA Iraq in 2005. I respectfully have to disagree Papa Delta (and MGen Toolan). Speed is of the essence in notification moreso than waiting for the proper uniform. Three Marines knocked on my door, 2 in Cammies and one in Charlies, if I remember correctly and my full memory of the moment is lacking. It mattered not to me, they were Marines and that’s all that mattered. They were delayed anyway (not of their own fault) and I basically knew they were coming.